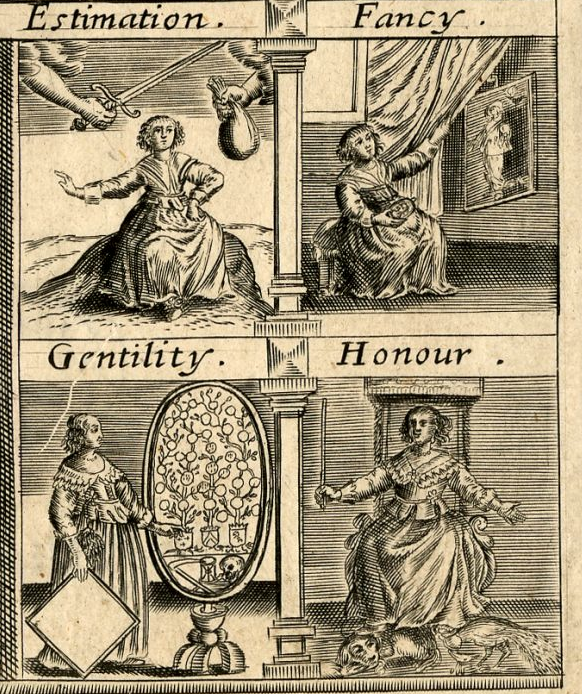 1646 Spotters guide to the current tide of religious groups in England. The Libertine. 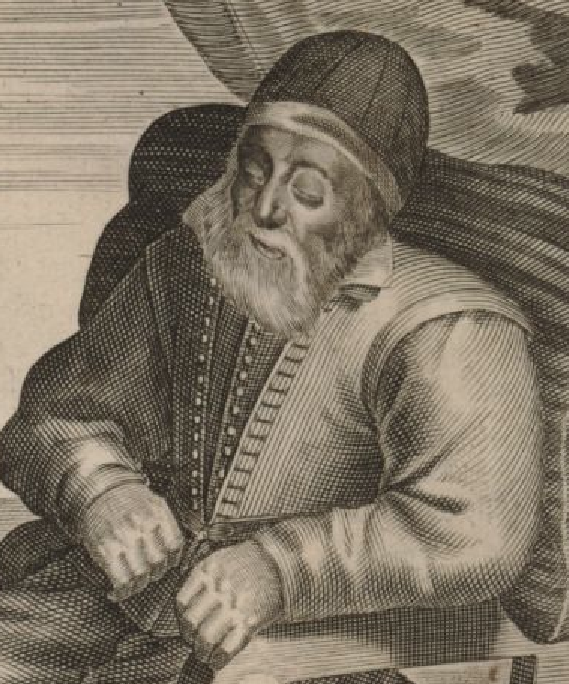 Not really a sect though the term was first coined by Calvin. Libertines were for physical pleasure over everything else and rebelled against moral restraints. 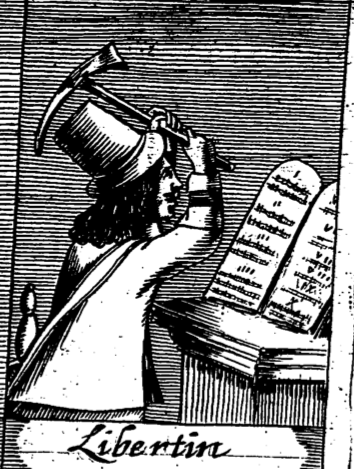 This chap is just about to smash the ten commandments with a hammer in his short coat, tall hat and sword baldrick. 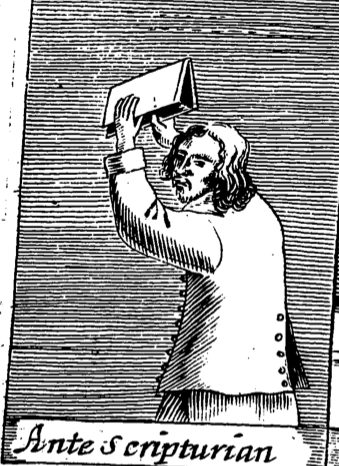 Thou must unfold the same or perish aye. Shall presse thee one day with a dreadfull weight. The Anti-Scripturian. This guy in a short coat (note the buttons on the back vent) is denying the power of the words in the bible. This doesn’t as far as I can tell seem to have been an actual sect, rather a feeling that not everything in the bible is literal truth. Since all mans might shall but confirme the same. 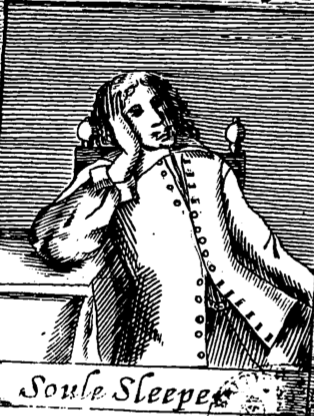 The Soule Sleeper believed that the human soul in not actually immortal, and that between death and Judgement Day the body is uncomprehending, in effect that the soul goes to sleep. 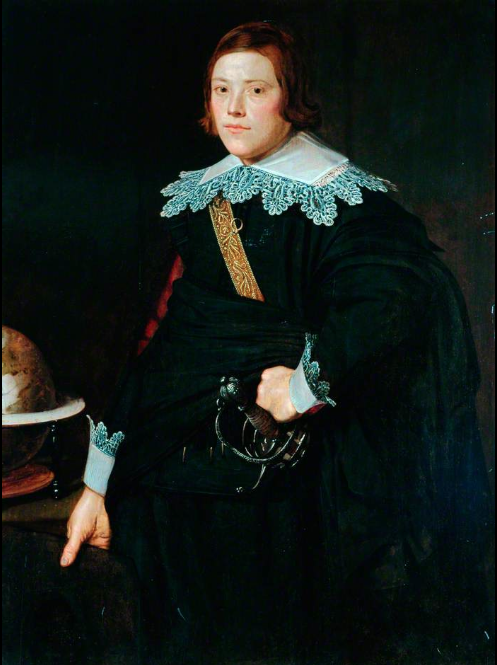 This chap is obviously thinking long and hard about this in his coat (or doublet?) and falling band. To woe or joy for all eternity. There are loads of details here worth looking at. The gentlewoman is wearing long skirts to her petticoat, a tabbed bodice, a fine layered kerchief and a ribbon in her dressed hair. 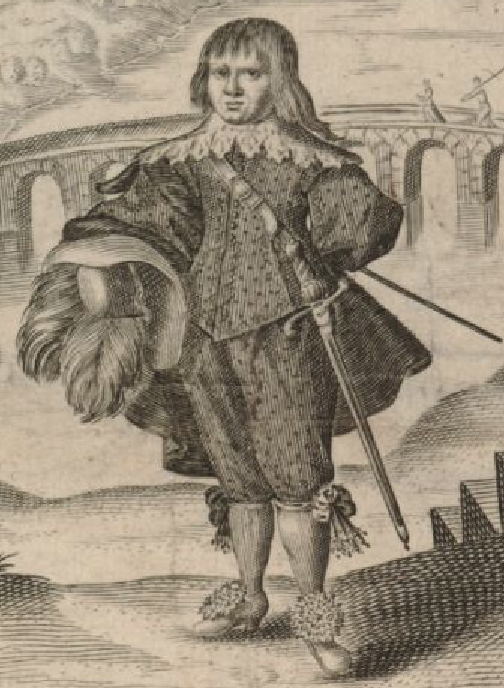 The gentleman has a tall hat, wide falling band, short doublet and breeches with a splendid pair of boots. 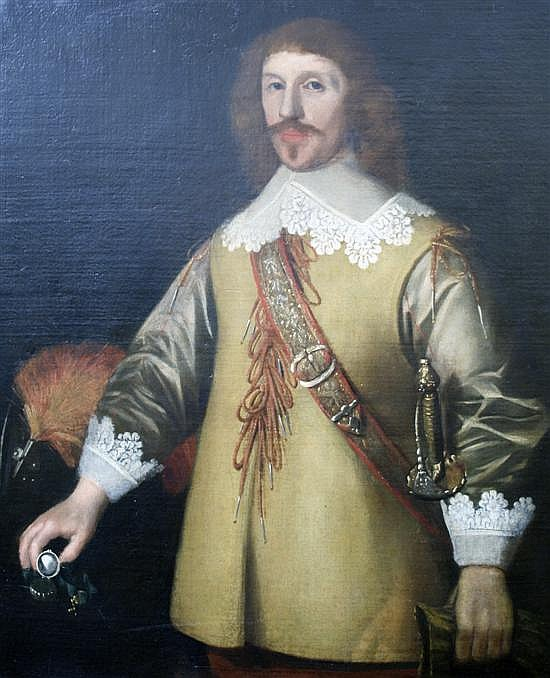 He is also sporting a fine coat with turned back cuffs in an off the shoulder manner, though notice that his falling band is arranged over the coat. 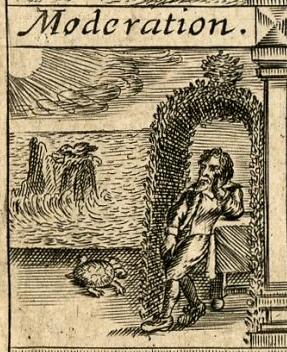 This ragged fellow contemplating a tortoise in the garden is more modestly dressed in a plain doublet, breeches and shoes. Here is a selection of smartly dressed gentle-women, in petticoats, bodices and a variety of kerchief styles. 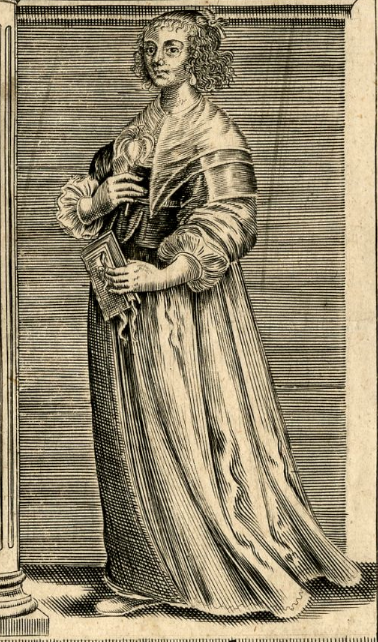 And this lady is wearing what I can only describe as a “nursing smock”, split to the waist and pulled open for use. 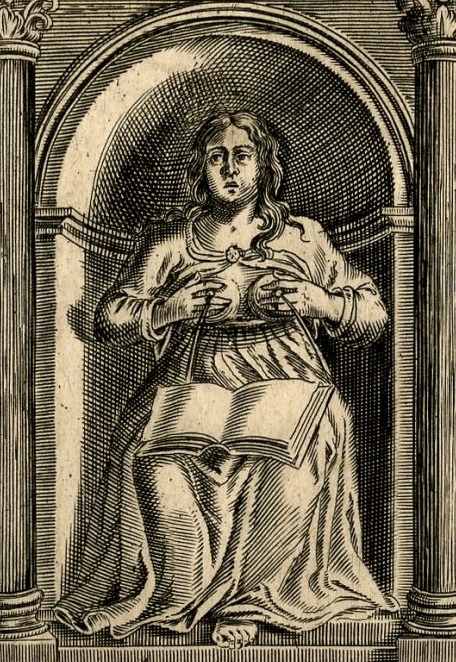 What it does reveal though, apart from the obvious is the pleats on her petticoat waistline. 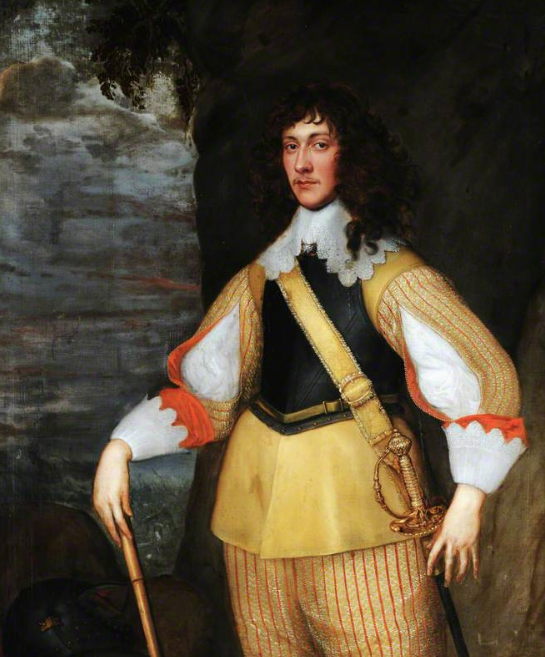 I think Sir Edward was briefly High Sherrif of Norfolk and son of Jacob Astley the royalist general, but it’s tricky to work out from the info available via google. 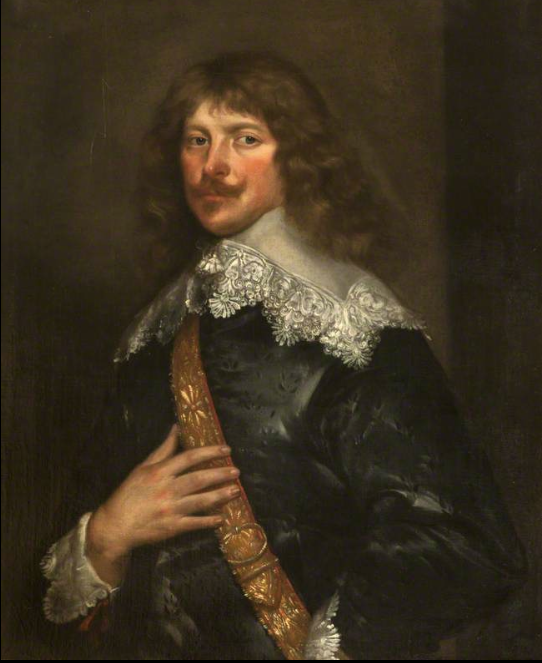 The painter is anonymous and the picture hangs in the National Trust collection at Seaton Delaval in Northumberland. Sir Edward is wearing what looks like a pinked satin doublet with a falling band decorated with wide lace that is also used on his cuffs. He’s also wearing a nice wide, either embroidered or embossed sword baldrick. 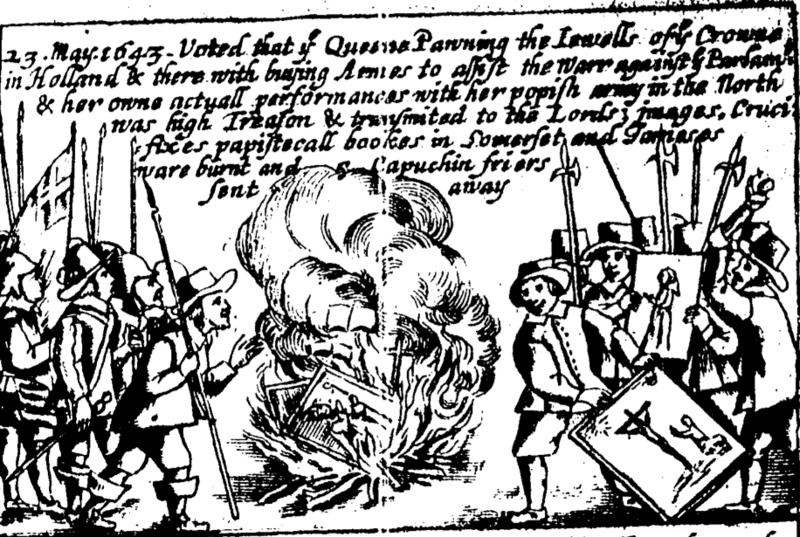 Political propaganda from 1649, published in a book, Anarchia Anglicana by Clement Walker. 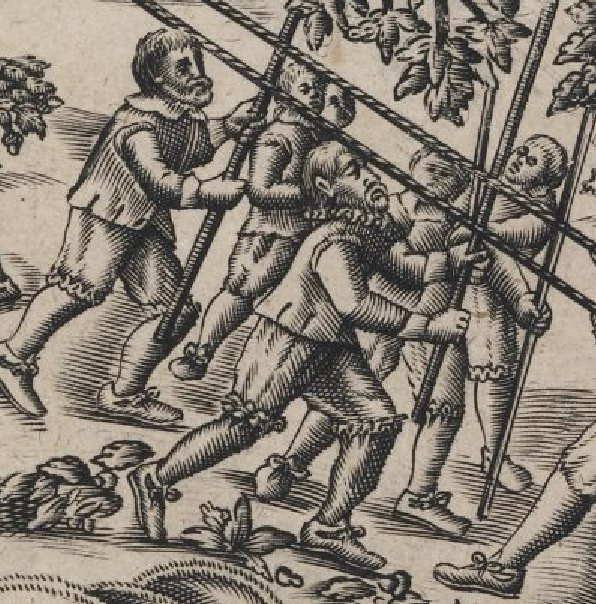 This is stirring stuff, Cromwell is directing a bunch of soldiers and workmen as they chop down an oak tree that is hung with symbols of the English state, the crown and sceptre, the Bible, Magna Carta and Eikon Basilike, the book widely thought to be Charles’ posthumous autobiography. He is standing on a ball suspended above the mouth of hell and seemingly about to be struck down by a bolt of lightning. 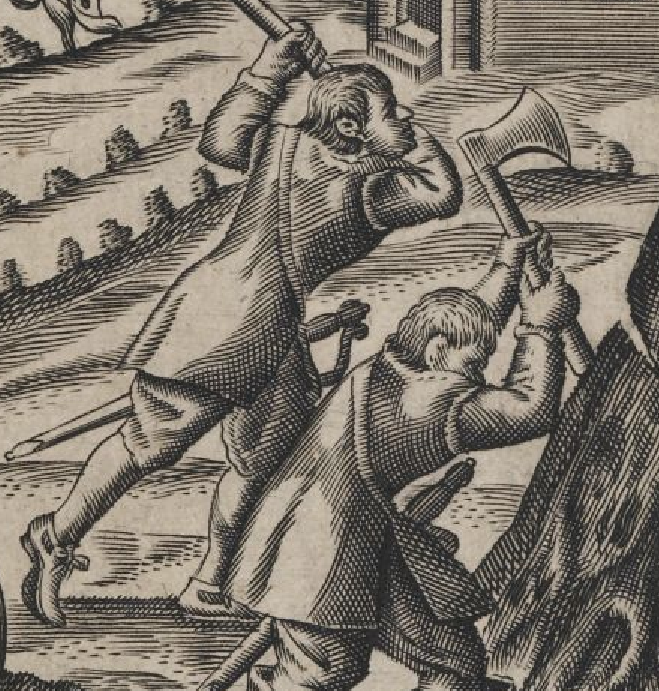 Here’s a close-up of two soldiers with axes laying into the tree. They’re wearing soldier’s coats simply cut with baldricks to hold their swords. Chap on the left has quite large cut outs in his shoes. A small bunch of what I think are workmen are cutting branches away with billhooks. They have no swords and are dressed in doublet and unconfined breeches with ribbon decoration. The doublet tabs are small and look like they are integral to the body of the doublet, rather than being sewn on as per higher quality examples. The guy in the foreground looks like he’s wearing a ruff. These two guys are making off with some of the boughs. 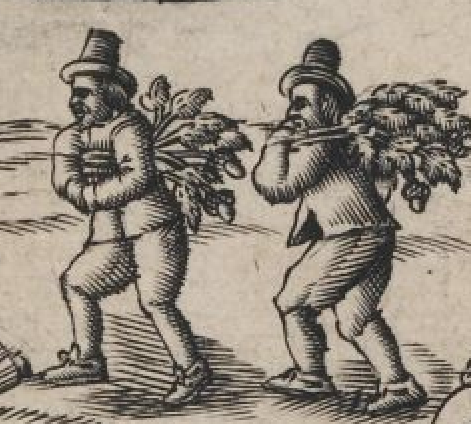 i’m not sure what they represent, but they’re wearing tall crowned hats, ragged coats and breeches. …of the present age. 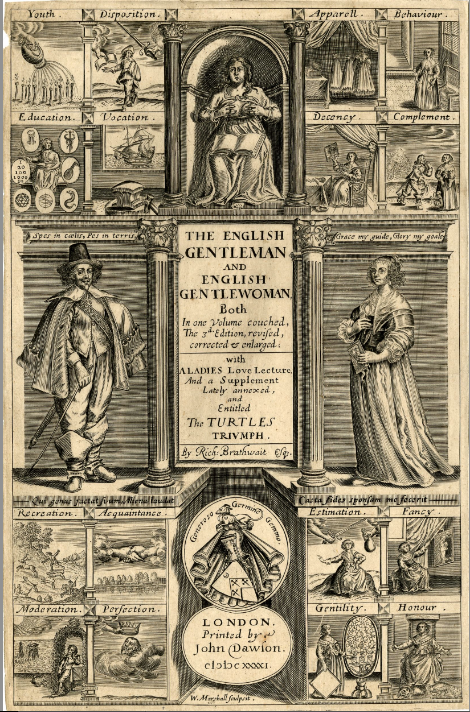 Broadside published in 1636 by Michael Sparke, engraving by George Glover. Two of the three we’ve met before. Jeffery Hudson the Queen’s Dwarf and Old Tom Parr the oldest man in the country. The figure on the left is William Evans, porter to King James and Charles. He is the tallest Welshman on record, being two and a half yards high. A favourite party trick was to produce Mr Hudson from his coat pocket to the amusement of all concerned. How they must have laughed! William wears a normal set of clothes for the time, but outsized! I liked this detail of his doublet. Notice how the belt that closes across his belly ends in a set of ribbon points making the closure line up to the down pointed waist line that was the fashion. Here’s Jeffery in what I think is a suit made of motley (speckled) wool. 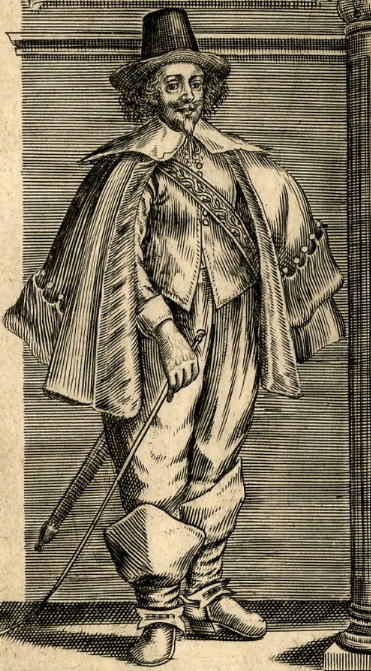 A typical garb for the royal fool. Looks like his band is motley too. Those heels would have been essential to gain a few extra inches. And good old Tom is asleep. I don’t blame him, he would have been 152 by the time the picture was engraved. I see he has two doublets, possibly to keep him warm in the days before cold winter payments and what looks like a 12 paned day cap. 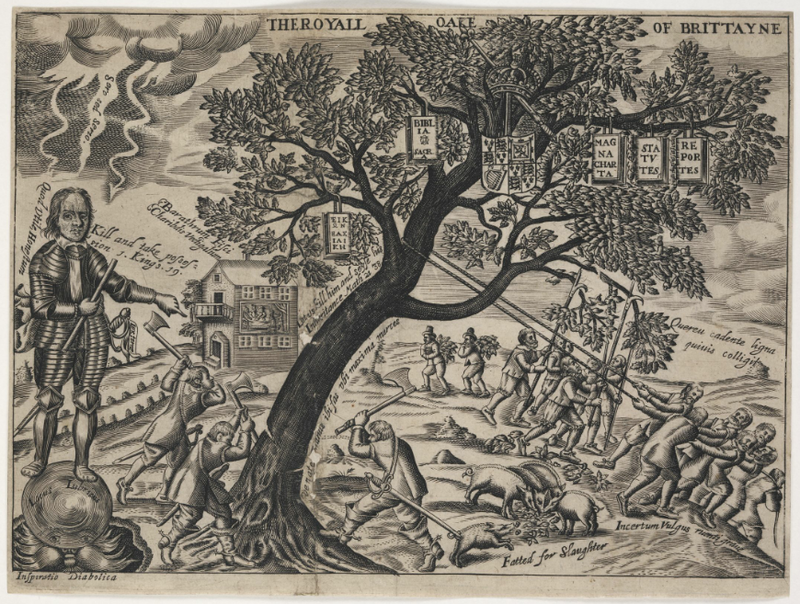 From the second page of illustrations, two scenes from what became known as the Bishop’s War. The first shows a bunch of soldiers in classic anti-episcopalian action, tearing down altar rails and removing pictures. Strange to think that this army was supposed to be fighting for the new prayerbook and Charles’ ideas of religious reform which included the very things being attacked here. Perhaps it should have made him think his ideas were a tad unpopular? Anyway, these soldiers are well dressed as far as I can tell, slashed sleeves, laced bands and hat plumes are all in evidence here, though the guy with the axe and his colleague stealing the silver from the altar are more simply dressed. A classic view of the two armies Scots and English meeting. 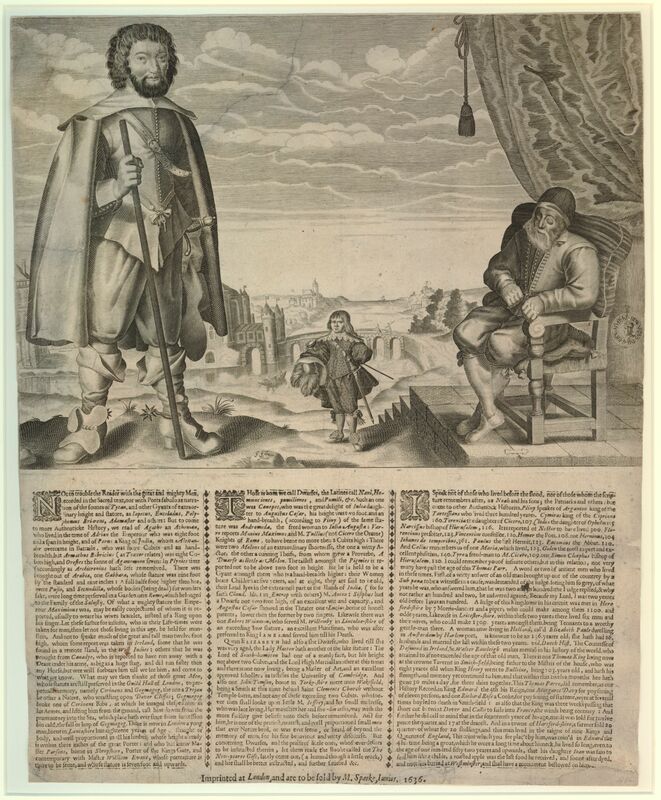 It wasn’t as cordial as the picture may have you believe, a battle was fought at Newburn which the Scots won, leading to a truce in lieu of a peace treaty for which Charles had to summon the Long Parliament to raise the necessary taxes. 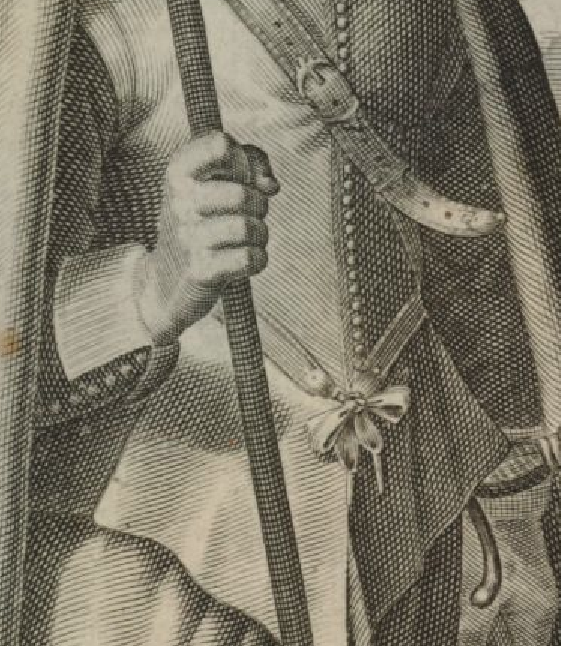 A few evident details of soldier’s coats and breeches and a smattering of morion helmets worn by the musketeers of both sides.